Make plain raw almonds a little more exciting with a dash of cocoa powder, a very light sprinkle of powdered sugar, and a shake of espresso powder for a healthy snack! Lots of us have heard that raw almonds are super good for us. They help raise your HDL (good cholesterol) level while lowering your LDL (bad cholesterol) level. 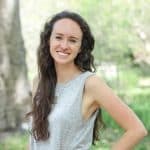 Almonds are high in monounsaturated fat, the same type of healthy fat found in olive oil, which has been associated with reduced risk of heart disease. Those little guys are also high in vitamin E, potassium, magnesium, and fiber, and are an anti-inflammatory food. (Sources: here and here). Basically, they’re awesome for you! 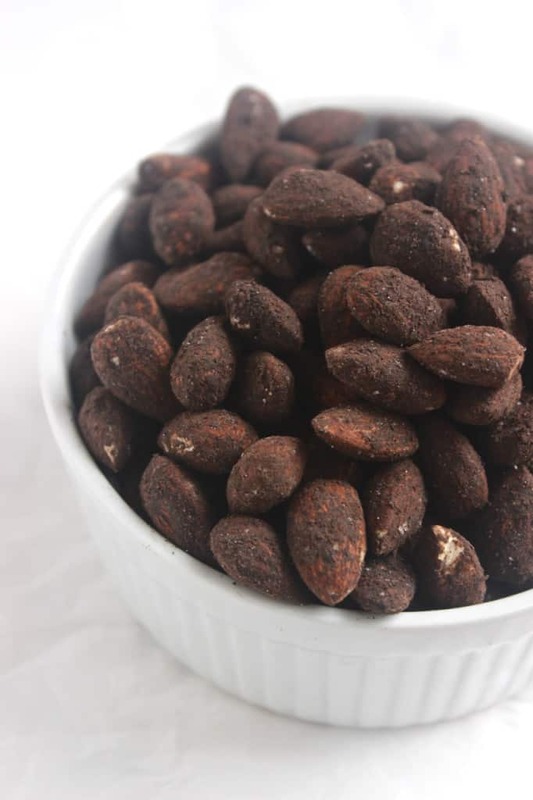 But if you’re like me and you get tired of snacking on raw almonds since they can be a little bland, I’ve discovered an easy, relatively healthy way to make them more exciting. 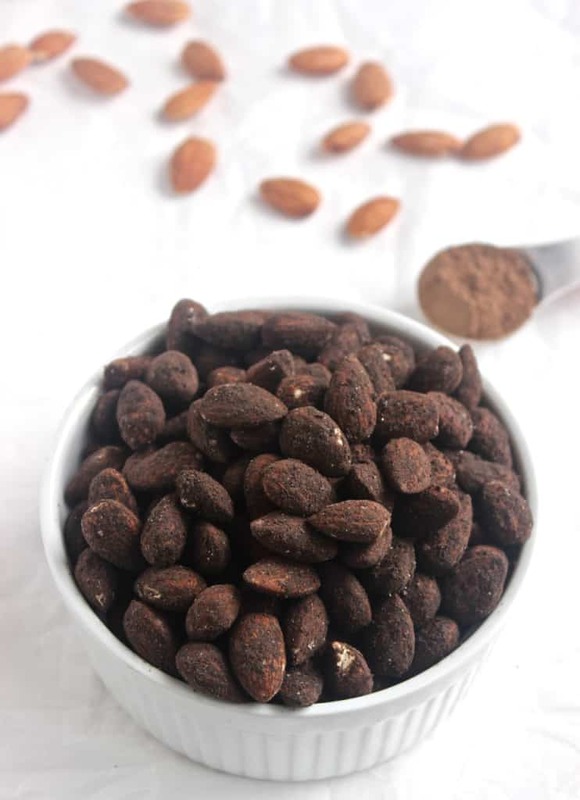 Just lightly toast the almonds in a small skillet (or don’t, if you’d prefer to leave them 100% raw), add a spoonful of coconut oil, and sprinkle on a mix of cocoa powder, a little bit of powdered sugar, salt, and espresso powder. The espresso powder is optional, but I love adding it to chocolate recipes like my favorite fudgy homemade brownies (old post alert!) because it deepens that chocolate-y richness. I’ll be the first to admit that these DON’T taste like the super decadent chocolate covered sea salt almonds you can buy, but I’d place those addictive things in the dessert category. They’re absolutely loaded with melted chocolate, and the nuts are basically an afterthought after the thick layer of chocolate. I’ve legitimately barred myself from buying them because they’re too. hard. to. stop. eating. And the serving size is 8 almonds. Ha. But these? They’re a healthy way to get your chocolate fix for the day and to enjoy all of the health benefits of raw almonds! With 6 grams of protein, 4 grams of fiber, and only 3 grams of sugar per 1/4 cup serving, they’re healthy enough to enjoy at any time of the day, even breakfast. (Speaking from experience here.) Hope you love ’em like I do! 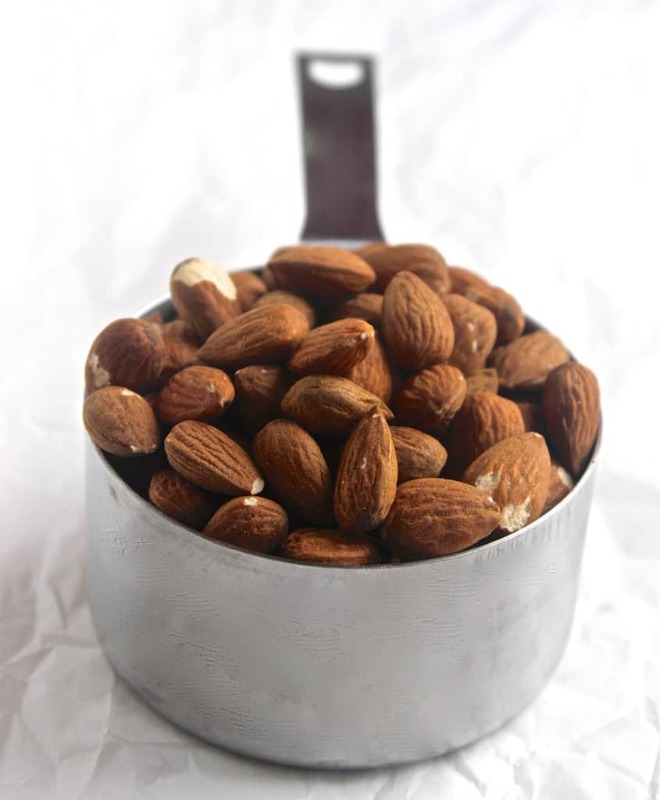 Toast almonds in a small or medium skillet over medium-low heat for 7-10 minutes or until fragrant and just slightly darkened. Add coconut oil, tossing almonds to coat. Remove pan from heat. Mix cocoa powder, powdered sugar, salt, and espresso powder (optional) together and sprinkle over almonds. Lightly shake off the excess coating and enjoy. The espresso powder sounds especially delicious in these! I love that you made them on the stovetop! I’ve made awesome cocoa-roasted almonds before, but it’s always nice to not have to heat up the oven when you want a chocolate fix! I agree, recipes seem a bit simpler somehow when you don’t have to use the oven! This looks so good!!! I like the store bought kind but I’d much rather eat this since the ingredients list is much better 🙂 I might have to give these a try this weekend! Thanks, Liz! Even if there IS a bit of sugar in these, I like that the ingredients are all recognizable! Dark chocolate + almonds is a hard combo to beat! These sound great!I like that they just have a hint of chocolate. To be honest I have never been a big fan of chocolate covered nuts. Don’t get me wrong, if they were in front of me I would eat them but I actually before raw nuts and then plain dark chocolate separate. I don’t feel like I get the best of both if they are together, lol. Very interesting! I love chocolate covered nuts but agree that you typically can’t really taste the nuts! We love almonds. I will have to try these recipes. Hope you enjoy them, Margaret! yesss, love this because I use to buy those chocolate almonds ALL the time at the store. Mmmm! Haha yes! Love the idea of adding these to your super bowl spread! Thanks, Ellie! Hope you enjoy them if you give them a try!! Wow, these look like one of the best snacks ever! I love chocolate covered nuts, and these have less sugar than most. 🙂 Thanks Liv! Yum! I love how simple but delicious these seem. I like the store bought version too, but I know this would be the superior pick! I can SO get on board with these! They look so delicious Liv! I love that you added some salt to them since that adds such a great flavor with the chocolate. YES to the espresso powder!! YUM. I love the addition of espresso powder to chocolate / cocoa powder recipes! These almonds look so delicious! I agree, it is so hard to stop with dark chocolate coated nuts! I definitely can handle the two separately in normal amounts, but combine them and I’m doomed. Lucky for me, they are also a tad pricey, which usually keeps them out of my cart lol! love that you made these! espresso powder is AWESOME in chocolately recipes. i first heard of it when making black bean brownies, to intensify the chocolate-y richness (as you put it! 🙂 ), and now always add it! 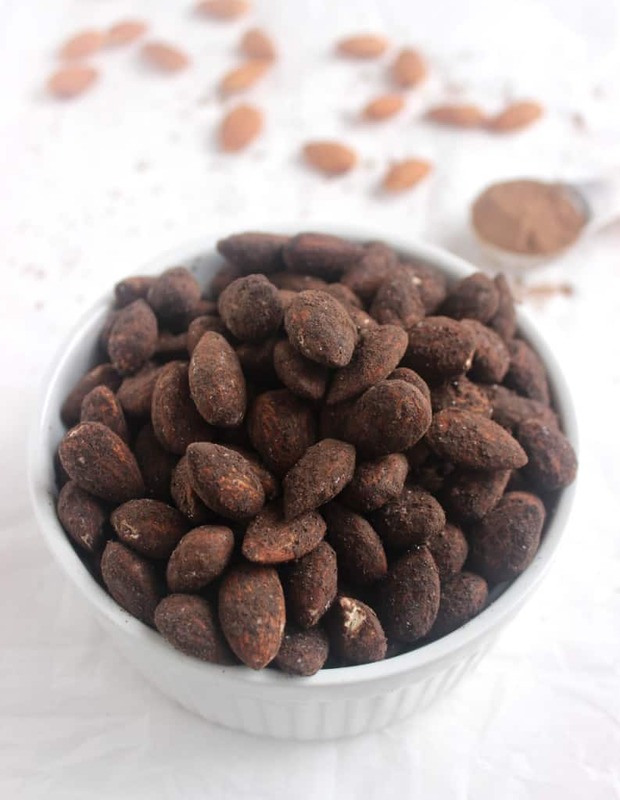 have you tried raw *sprouted* almonds? i buy them from the bulk bins at WF and LOVE them! slightly different texture/taste. 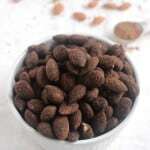 I actually have tried raw sprouted almonds! A couple of people I know started buying them since they’re supposed to be easier to digest and I gave them a try. I did notice that the taste and texture was a bit different but I’m a fan! The only downside is that they were a good bit more expensive when I bought them…but apparently you can soak and sprout you own almonds, too! what i find interesting is my parents alllways soaked almonds when i was younger, because (it’s an indian thing? and) they were told growing up that it makes them easier to digest too!